one CE project dedicated to DV. These must all be new projects, and DV Bonus projects for RRH and Joint TH and PH-RRH must use a housing first approach. 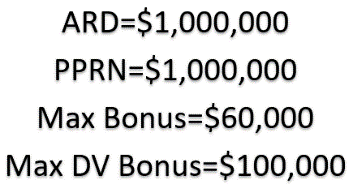 A DV Bonus project’s ranking on the priority listing will not affect its likelihood of being selected. Whether the project is ranked first, last, or somewhere in between, it has the same chance of being selected. There are additional questions in the CoC application that are specific to the DV Bonus, but the DV Bonus project applications are the same as those for other CoC projects. HUD will review the DV Bonus project applications and the specific DV Bonus questions in the CoC application. If a CoC’s DV Bonus projects are selected, HUD will remove the selected projects from the CoC’s priority listing. As a result, projects that had originally been ranked below the selected DV Bonus projects will move up. If a CoC’s DV Bonus projects are not selected for bonus funding, then the DV Bonus projects will remain on the CoC’s priority listing and will be eligible for funding as (non-DV) bonus projects through the CoC Program as shown in Fig. 1. More information can be found in Sections II.B.3 and II.B.10.e of the CoC NOFA and the DV Bonus FAQs. Fig. 1. Comparison if DV Bonus projects are selected versus not selected. HUD structured the NOFA this way so CoCs that have a highly-rated new project for survivors of domestic violence would not have to guess whether it is more likely to be funded if they apply for the DV Bonus or if they rank it highly in their priority listing as a DV Bonus project as seen in Fig. 1. This demonstrates how the priority list will change if a DV Bonus project is selected or not selected. 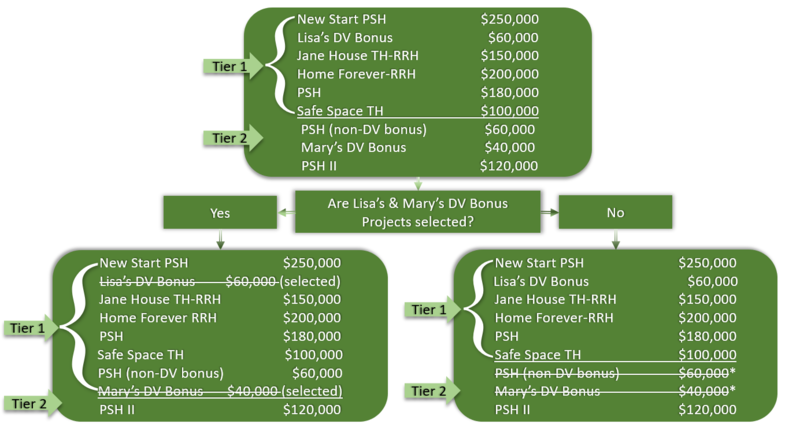 It also shows that if Lisa’s DV Bonus project and Mary’s DV Bonus project are not selected, they change to regular bonus projects. The DV Bonus is an incredible opportunity to leverage the partnerships between housing providers and victim service providers. Many of the CoCs already have strong relationships with victim service providers in their communities, and in some cases, victim service providers serve in leadership roles in the CoC. To successfully implement DV projects, CoCs should integrate their DV Bonus projects with the broader DV system. Safety and trauma-informed services for people participating in programs should be at the forefront. The Domestic Violence Housing Technical Assistance Consortium (DVHTAC) created the Safe Housing Partnerships website to provide resources and guidance on the intersection of domestic violence and homelessness. We strongly encourage CoCs and project applicants to utilize the website in your program development and implementation. The DVHTAC is funded by a federal partnership between U.S. Department of Health and Human Services’ Family Violence Prevention Services Program, U.S. Department of Justice Office on Violence Against Women and Office for Victims of Crime, and our Office of Special Needs Assistance Programs. State Domestic Violence Coalitions will also be a great asset in your planning and program implementation. Coalitions serve as state-wide and territory-wide leaders in the efforts to end domestic violence. These organizations connect local domestic violence service providers and are valuable resources for information about services, programs, legislation, and policies that support survivors of domestic violence. You can find the contact information for your state coalition against domestic violence on the National Network to End Domestic Violence’s website. For additional questions on the DV Bonus in this year’s competition, please submit a question to HUD’s Ask A Question (AAQ) portal (select system: “e-snaps” when prompted).